Batman and Scooby-Doo are teaming up for the first time since the early 1970s, in a bizarre episode of Batman: The Brave and the Bold airing April 1. And here's our first glimpse! The crossover airs as part of a special episode called "Batman's Strangest Cases," in which the all-powerful Bat-Mite (Paul Reubens) takes us through some weird alternate realities. 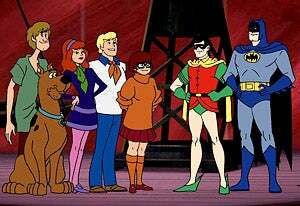 Including the Scooby-Doo crossover, which is done in the style of early 1970s Hanna-Barbera animation. And an old Mad Magazine spoof from the 1960s. This is the episode the show's producers told us about ages ago.